Street debating is a job to bridge social divides which also works as a social alternative to begging. Street debaters use a set of scales that makes public opinion visible with coins to evoke a discussion with the passerby. This job aims to promote empathy and tolerance in the society by creating an opportunity for people to break out of their own social bubble to meet people with different opinions. The initial study showed that on average, street debating earns £13.5 per hour in London and stops 12.5 people for a friendly chat. From politicians to chefs, anybody can become a street debater to question the society. The device data is open source and can be made by anyone. 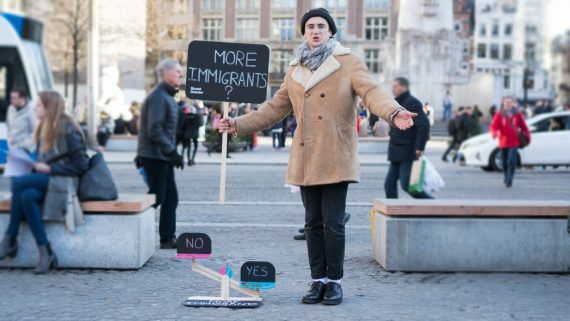 Currently, several street debaters are raising their own debate across the world from Barcelona, London to Capetown. This project best represents the empowerment category because it empowers people who have no voice in the society to speak out for themselves. It also empowers the community as a whole by providing a place where opinions of social importance can be openly discussed.